When you buy a ticket for a Bond movie, you pretty much know what you’re going to get. Skyfall, released at the 50th anniversary of the franchise, drinks a toast to the old ways with a 50-year-old Macallan shared by Bond and his new villain. In the opening action set piece, Bond (Daniel Craig) is trying to recover a stolen list of names of undercover agents. In the process, fellow field agent Eve (Naomie Harris) shoots him off a train into a remote waterall. Bond is left for dead and M (Judi Dench) is asked to resign over the lost data once this all gets sorted. Spoiler alert: Bond wasn’t really dead. He returns to MI6 just in time to see it blown up by someone who is so good with computers he or she can cause a massive gas explosion remotely (top that, Anonymous!). M and Bond agree that he should pursue the lost data before the names of undercover agents get Wikileaked, but first Bond has to reapply for his job. Bond follows leads to Shanghai, Macau, and finally a little Island of Dr. Moreau (“Mr. Silva,” actually, played by Javier Bardem, now with blond hair). He manages to trap Silva — but a little too easily, which can only mean that Silva has MI6 exactly where he wants them. Directed by Englishman Sam Mendes and written by committee, Skyfall follows the well-worn pattern of Bond movies. If you like the pattern, you’re likely to enjoy Skyfall. The opening scene is a very satisfying set piece with cars, motorcycles and guns. Fruit carts in the bazaar get knocked over before the scene even gets started. When Bond starts operating a backhoe on a moving train, it’s a giddy thrill. Before long we’re into the opening titles, and I think Adele is an excellent choice for the theme song. 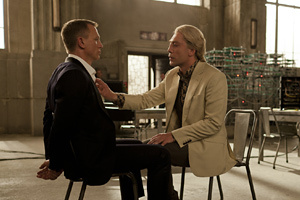 Perhaps because of the anniversary, Skyfall is a very Bond-y Bond film. The old Aston Martin makes a cameo, red button and all. And Bond finally gets a backstory — something none of the other films have brought up — as though Bond were Bruce Wayne. Whether that’s a good idea, I’m not sure — I can’t imagine James Bond as a child, and I don’t think it helps me enjoy the movies on a deeper level. I keep coming back for the stunts and the quips, not for pathos. It is also a very British Bond film. Much of the action takes place in London, in MI6’s back yard. There is also a prominent visit to Scotland. Contrary to Britain’s image as an imperial power, the standoff there is a plucky, spirited defense of the old homestead (“[Blam!] Welcome to Scotland!”) against an army led by a disgruntled immigrant. Skyfall is also a new beginning. There are enough new faces that you might even call it a reboot. I’ll leave you to discover some of them yourself; the only one revealed by the trailers is a new Q played by Ben Whishaw. Where Desmond Llewelyn’s Q could have been a middle manager at IBM in its heyday, Whishaw’s could be doing community service as part of a sentence for DDoS-attacking MasterCard. There are other signs of “new” Bond thinking in some of the attitudes expressed. Bond’s drinking is no longer debonair sophistication but rather a sign of alcoholism, and his disrespect for authority isn’t cheeky or groovy but indicative of a troubled and unstable personality. Silva makes a gay pass at Bond, who gives an ambiguous rebuff.